When setting goals, one of the most highly recommended things to do is to write your goals down. For someone like me, there are many, many ideas running around inside my mind, but not enough time to do them all. In January, I posted an article, What Do I Want, where I answered this question in terms of goals and a vision that I had written in 2008. In the comments, one my readers, Kim of (Anti) Social Development gave me a link to 101 Strategy, which ultimately led me to the Day Zero Project, home of the 101 Things in 1001 Days. The project is pretty straightforward. Create a list of 101 things that you want to do in 1001 days, or about 2.75 years. This seems like a reasonable length of time to turn ideas into goals, and to accomplish them. 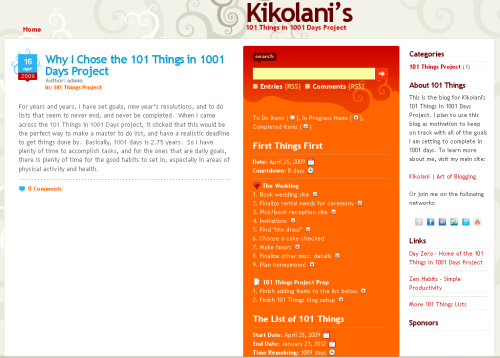 Since January, I have been on and off working on a sub-domain of this site, at Kikolani’s 101 Things. I have started my list of 101 things that I want to do, which is a little over 50% complete, and will continue to add to this list as time goes by. So far, the list covers goals in the following areas: personal, health, learning, home, financial, writing, creativity, blogging (of course), and travel. Then there is the #57 – 101 to be determined goals to follow. The start date is April 25th of this year. I chose this date because this is the day I’ll be getting married. It is a start of a new life, and a perfect time to get things in order and start moving forward with the always loving support of my wonderful husband. I believe that creating a blog with my goals will help me achieve them. As I have learned since creating this site, blogging can be a great tool for self-discovery. I will have a written list and a reasonable deadline to complete them, and will (hopefully) build a community that will keep me on track with the things I want to accomplish. I hope to network with others that are working on this project as well, or people who do some of the things in my list that could offer ideas or advice. I will update Kikolani’s 101 Things with any planning, mind maps, accomplishments, setbacks, etc. as they come along in relation to the goals on the list. At Day Zero, there is a getting started guide, and at 101 Strategy, there is an article about how to start your own 101 project. The fifth step in the latter article is to be brave and tell someone, so I am telling all of you, my readers. I hope that, if any of you are working on this project, that you will let me know and join me on my mission to complete 101 things in 1001 days. Do you use blogging for self-discovery, motivation, or goal setting? Feel free to share your experience in the comments. I am always open to new ideas, and inspiring success stories!